Mark: Sure, Mystical Warriors of the Ring is a Universe much like our own. There exist no humans and only animals that are anthropomorphized. 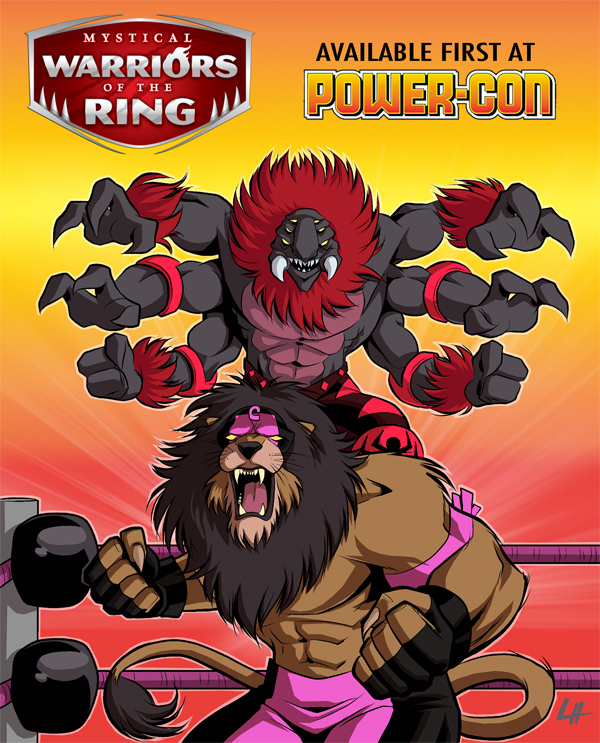 Their primary form of entertainment is professional wrestling, provided by the Arcane Wrestling Federation (AWF). Its a call back to the early 80's and 90's when Professional Wrestling was one of the biggest forms of entertainment available. There is a long history to the AWF and we are just scratching the surface this year with our characters. There was an entire generation of wrestlers that came before the ones you are seeing and they competed in a yearly tournament (like Japanese and Mexican wrestling histories have); over time that got changed to a championship belt and a system similar to one most wrestling fans are familiar with. This series has some seriously awesome concept art! 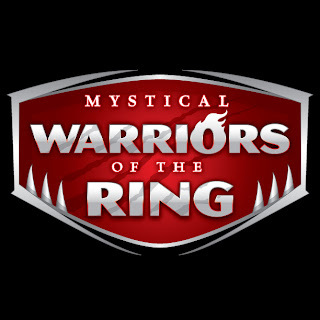 What inspired you to create the Mystical Warriors of the Ring: Are you just a fan of mystical warriors and wrestling in general or are you actually a real life anthropomorphic wrestler? Ha! I would totally be a gigantic elephant wrestler if I was. As for what inspired me, I have always been a fan of professional wrestling and cartoons. We would see WWF and NWA live in Maryland growing up, I would watch AWA and WCCW on TV, and as a young adult me and my best friend would travel regularly to see ECW in Philadelphia just as it was in its prime. When I was little I remember watching Hulk Hogan's Rock N Wrestling and that left a impression on me that has lasted for decades. Now I am at a point in my life where I feel like its time to channel that love and those memories into the thing I love most...toys! I think they should be excited because it's a passionate throwback to great mini figure lines of the past (MUSCLE, SOMA, Monster in my Pocket). 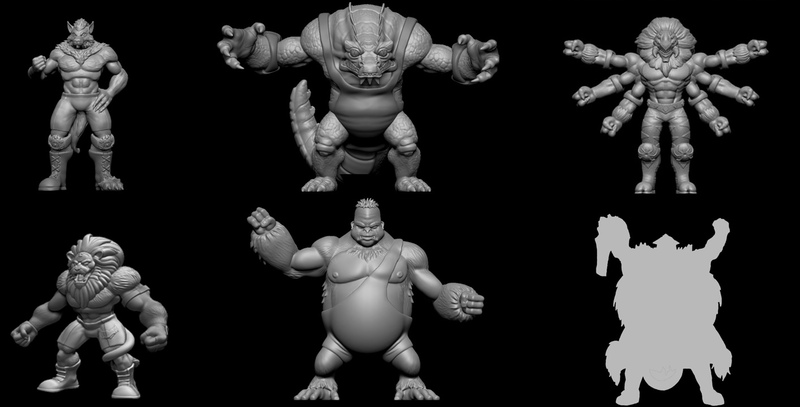 The sculpts are highly detailed and strike a nice balance between traditional wrestlers and really cool animals. I have brought together what I think are some of the most talented people across the spectrum of indie art today to help me release top quality figures. So you know when you buy one of our releases that a lot of thought, time, and care has been put into it. Digital sculpt of Widowmaker- probably my favorite so far! You mentioned Mystical Warriors of the Ring as being a passionate throwback to lines like M.U.S.C.L.E. and Monster in My Pocket. How do you think fans of those great lines will react to these? I hope very well. I collected M.U.S.C.L.E. growing up and have a lifelong love of the characters it's based off in Japan (Kinnikuman). So when I set out to create this line I try to make sure that in certain ways it treats that toyline with the respect it deserves. You can see it in characters like Widowmaker whose pose is a loving homage to the M.U.S.C.L.E. Ashuraman. You can also see on my site I tend to collect lots of other minifigure lines and these toys are designed to work with them as well. In fact I recently posted our figures taking on the WWE Rumblers to prove that very point. A prototype of Goliath next to a WWE Rumbler figure to help give a sense of scale. I definitely caught the Ashuraman reference, especially when looking at Widowmaker's silhouette. Did you have a particular favorite M.U.S.C.L.E. character when you were younger? (mine was Sunshine). 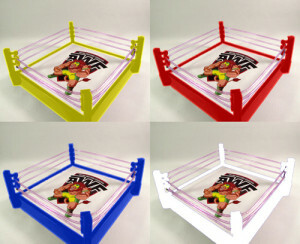 Mark has a number of different themed in-scale rings planned for the characters to wrestle in! Your mentioning SOMA toys earlier really brought me back. I loved those little guys as a kid: I remember having the Robin Hood set, the Pirates, and a bunch of ninjas. As a kid, despite having lots of well articulated action figures, there was always something really special about preposed minifigures. Why do you think these types of toys appeal to us even when we're surrounded by plenty of other super articulated action figures? I think because they allow for instant playability, I mean they are already posed so in a way they are dictating to you how they are used and its up to your imagination to figure out other combinations to make the poses work. This differs from super articulated figures in the sense that with those you can make them do pretty much whatever you want at any given time. I also think the simpler nature to the design brings a nostalgic factor to adults who grew up during the many minifigure crazes of the past 30 years. In addition there is the obsession with collecting that plays into it, long before Pokemon there was a gotta collect them all mentality with minifigures. We see it even now with the success of blind bag minifigures from My Little Pony which has spawned ones for GI Joe, Transformers, Angry Birds, etc. I'm just a layman here: Explain to me some of the process behind creating this toy line. First I sketch up all the characters, they are all inside my head (many more than you are seeing now). I have been out of the art game for a VERY long time so I entrust one of my dearest friends Jazyl Homavazir (Creator of the very successful indie comic Beast Legion) out of India to take my sketches and bring them to life. Once that is done I pass that art and some design notes to my insanely talented sculptor Simon Grell. He sculpts them digitally and after a few passes back and forth we have a figure. It then gets produced via a Digital Printer and delivered to me. At this point it goes to the only man I would ever trust with my figures, Marty "THEGODBEAST" Hansen to take and make a working prototype that can be replicated and released. 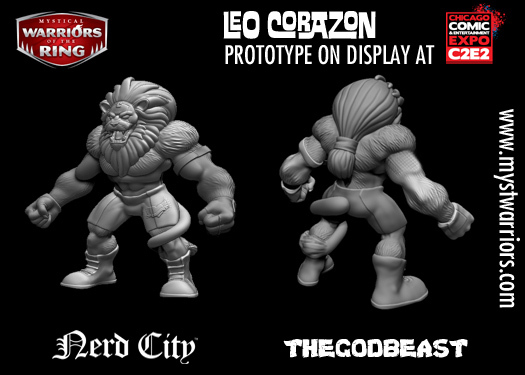 Another cool promo shot of the character Leo Corazon. We're seeing more and more individuals creating their own dream action figure and toy lines these days through independent initiatives. As someone who sells toys as an online retailer, how do you see the action figure industry changing because of self funding initiatives? Well big retail is much too complicated, you have to worry about how stores market your product and shelf space is at such a premium your product really does not get time to build an audience unless it is a hit right from the start. Of course these bigger toy companies just take the loss and move on to the next product. But I love the indie toy scene because there is a deep love in the design and release of the toys that you just do not get at the retail level. Look at what October Toys is doing with O.M.F.G., what Matt Doughty and Onell Design are doing with Glyos, or what the Four Horseman are doing with Power Lords. As action figure and toy sales dwindle at the mass retail level, I think they gain a new home online. Even mass retail is realizing this, just look at MattyCollector. Masters of the Universe Classics for example follows the indie toyline example of small production cutting out the middle man known as retail. It also returns power back to the creators, you become responsible for promotion and release and I think that builds a more direct connection with your customer. You get instant feedback and can actually interface with their desires and concerns. The ability to use things like indiegogo and kickstarter also now make the financial commitment to indie toy makers less of an issue. You can market directly to your fans and make them part of the development process. Something that just was not possible a few years ago! What are the biggest challenges you're facing in creating your own toy line? The biggest challenge is getting the word spread. There is so much content on the internet that its easy to get overlooked. Its one of the main reasons I am releasing them first at conventions; in that atmosphere you can reach people easier when they are in front of you and able to look at your product directly. If they find it cool they tell their friends or post about it online and then you have new eyes on your product. You can pay for advertising but I have always found the best way to sell is to make someone happy and the rest takes care of itself. 5 of the first 6 figures to be released in the line! Now Mark, you not only create and collect action figures, but you also run an online toy store: Fantastic Plastic Toys. Can you tell us a little about that? I have been collecting, buying, and selling toys for more than a decade. For the past 4 years I have spent a large part of my time helping my overseas friends acquire US toys they would not be able to get otherwise. With the rising fees of eBay it just made sense to open my own store and offer my services to more people. My wife is also a doll collector so it was decided my store would cater to what we enjoyed. Its a bit different then a lot of retail stores in that we carry only what we like. What toy lines do you personally collect? For modern toys my main collecting focus is Masters of the Universe Classics, Star Wars The Clone Wars, and Teenage Mutant Ninja Turtles. For vintage toys I collect Go-Bots, Centurions, Robotech, C.O.P.S., and GI Joe from time to time. You seem to have lots of convention exclusives coming up for Mystical Warriors of the Ring. Can you tell us about a few of these that you're excited for? They are all like my kids though, its hard to pick and choose who to talk about. I am most excited for our first release coming up at C2E2 in April. 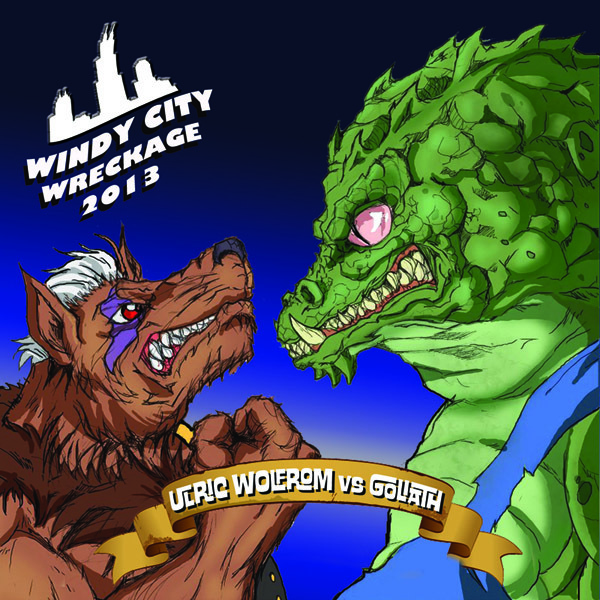 We will have a limited number of Ulric and Goliath figures for sale. Ulric is near and dear to my heart, being the first character I created. But Goliath has to be seen to be believed, he is almost 2.5" tall and almost 4" wide. Pictures do not do him justice, the details on the figure as well as his sheer size and weight makes him one sweet figure. 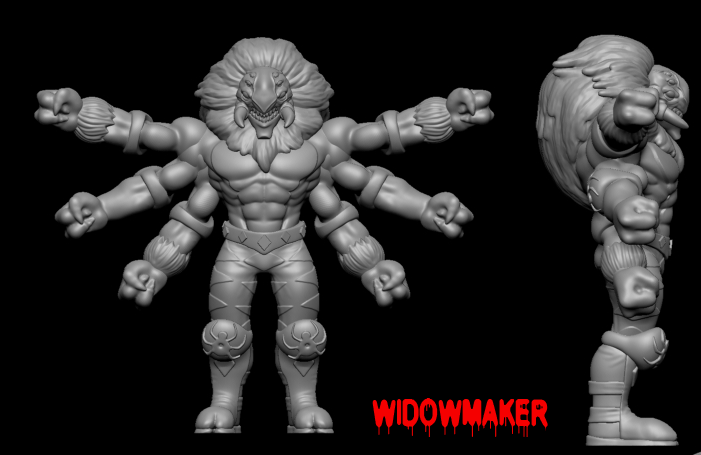 Widowmaker the Spider is our PowerCon Exclusive: a lot of people love the design and being lifelong He-Man fans we figured that was the best place to release such a cool figure. Kayin the 2.5" Gorilla is set for New York Comic Con, like Goliath his size I think will impress people when they hold him in their hands. It really sounds like there's a lot more going on with this line besides amazing artwork and just creating plastic figures. What's all the hoopla I hear about videogames, cartoons, and such? Unlike a lot of indie projects and collaborations this is all part of a 3-6 year plan, figures are just a part of that plan. The character designs and stories just scream to be told in a variety of media. I am working with an independent animation company to produce a few 30sec-1min shorts to promote the release of each series of figures. It is our hope to create a 10-20min pilot episode and use that to launch into an animated series. At the same time we are currently in the R&D stage for a simple arcade like video game. I believe the characters have a lot of life in them and will really connect with people as their stories unfold. I'm sold. We're all sold on these little guys: How will toy collectors be able to purchase these? Any price estimates yet? I am setting aside a small % to sell via my online store the first week of May. The release schedule will be constantly updated on our site and we have planned two online only releases (one in the Summer and one at Christmas). Pricing and contents of the first releases will be available in early April. We are still working on the final details. But it will be priced similar to many other independent releases. Its not mass produced in China so your readers should keep that in mind. Another thing to keep in mind is these figures will be made of very high quality UV Resistant Urethane so they are not meant for kids. 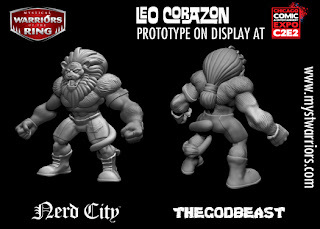 We chose this because the level of detail in the sculpts and just the overall appearance required it. Once people see the figures in person they will agree we made the right choice! If there is a demand for other types of material we will look into it. 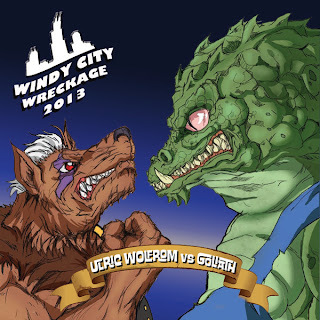 Ok, hypothetical situation: You are mysteriously summoned to an intergalactic wrestling competition and can choose to be one anthropomorphic animal. You also can choose one former U.S. President (living or deceased),and one fictional character whose name start with the letter R to wrestle alongside you: Who do you pick and what is your stage name? Mark, thank you so much for your time and best of luck to you! 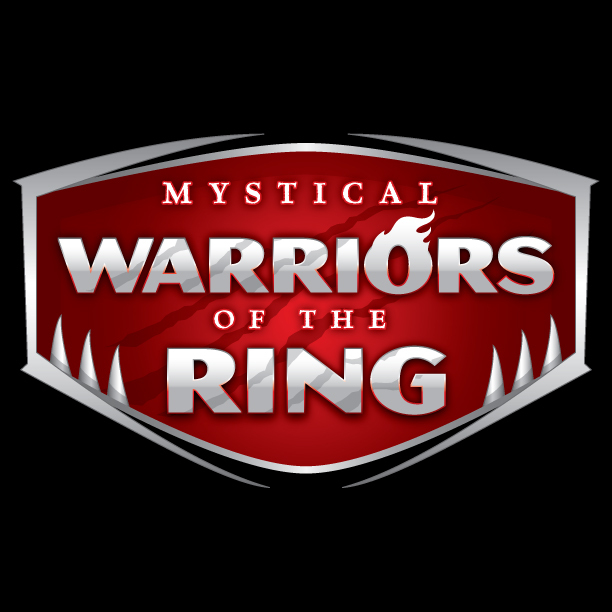 Folks, check out the website for Mystic Warriors of the Ring and stay tuned to ThEpic Review for more news on this exciting toy line. If you're a creator or designer working on your own toyline and you want to talk about it, email me at thepicreview@gmail.com and let us know. We would love to feature you on ThEpic Review! If Barbecue17 were an anthropomorphic animal he would definitely be a dog, as a routine of lying around the house all day and waiting for the mailman wouldn't be too much of a change from his normal habits. He'd also have more time to write reviews on Amazon and post action figure pictures on his Flickr account.